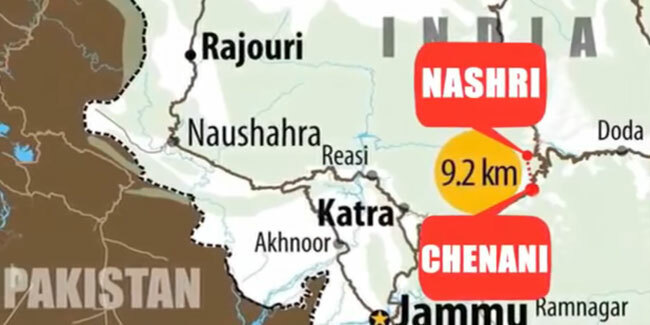 Chennai - Nashri Tunnel is a 9 km long, twin-tube, all-weather tunnel between Udhampur and Ramban in Jammu & Kashmir. It is not only India’s longest highway tunnel but also Asia’s longest bi-directional highway tunnel. Built at an elevation of 1200 metre on one of the most difficult Himalayan terrains, the tunnel cuts the travel time between Jammu and Srinagar by two hours, bypassing about 41 kms of road length. The tunnel has been constructed at a cost of about Rs 3720 crore and is a part of the 286-km-long project for four-laning of the Jammu-Srinagar National Highway.